Electricity is cheap, gas is cheaper and equally multi-purpose. With all the buzz around the commodity in the last few years many of my friends asked me – why don’t we simply use electricity? Will it really make such a difference in our bills? The short answer is yes. Gas is maybe the easiest and cheapest way to maintain the normal life in our homes. We can cook, heat water in the boiler, warm the whole house with it. With all of the benefits, come all the risks and if not used and maintained properly, gas appliances may be dangerous. How to maintain gas appliances? 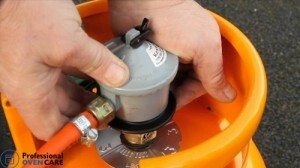 Make sure your gas bottle is new and reliable and covers all the regulations for bottles and gas hobs. Any leaks or damages on the outside or on the top of the bottle may put your life and the safety of your family at risk. Never underestimate the danger of working with gas. Never leave the bottle under direct sunlight. If it explodes, the wave will certainly destroy your home and everything and everybody in it. When filling the bottle, mind the way you carry it. Inappropriate handling may cause injuries to your back, neck and arms. Don’t let the bottle to roll loose around in the car during transportation. You never know when you’ll have to stop suddenly and the bottle may fly forwards and hit you. With weight of over 10 kilograms, this is the last thing you want. On top of all, the bottle may hit sharp edges or hard objects which is dangerous. After filling the bottle, always make sure there are no leaks. A simple and effective way to check the nozzle if by pouring just a few drops of water on it. If there are bubbles, get rid of the bottle as soon as possible. It leaks and it’s dangerous for you. More tips on: safety use and installation of gas systems! 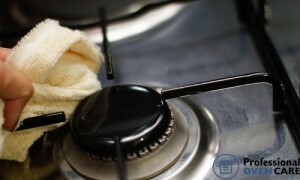 How to clean a gas oven and hobs? What is needed for safe and spotless cleaning? You need the bottle dismantled and put away. You’re going to use chemicals and you cannot know what sort of reaction may start. Play it safe. Spray the hob, no matter if ceramic or gas hob, with solution and leave it for at least 15 minutes to loose the dirt and the grease. Clean by using wired brush and sponge. Leave it to dry before attaching the gas hose back. Always have the windows open. Even if there is a leak, you don’t want the gas to be compressed. The more fresh air enters the room, the better. Use special lighter with long handle. It’s much safer. I hope these tips will appear useful for you. We will continue with our handy ideas and tips next week. If you want you can leave a comment under the the article, or if you need professional cleaning services, you can call us or use the booking form. This entry was posted on Tuesday, July 1st, 2014.